Our online tracking tool is the simplest and fastest way to track the whereabouts of your order..
Once your items have left our warehouse, you will receive a tracking number in which you can use to track the status of your delivery. (Please note this is not your order number, but the tracking number you should have received via SMS). Please ensure that someone is present at your delivery address to receive your items as re-delivery fees may be incurred. For any other questions regarding freight, please contact our freight company. 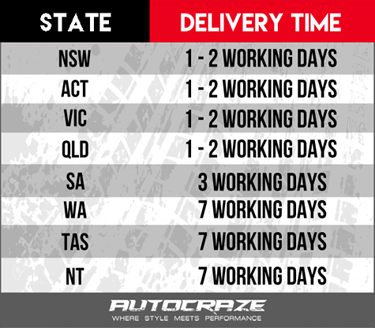 We know how eager you are to receive your wheels and although we do everything in our power to get your items to you as soon as possible, the shipping times below are only an estimation. Please note that shipping to rural areas may also take longer. We have two freight providers that we use. We will notify you of the freight company that will be carrying your products, along with your tracking number, once your order has left our warehouse. For all Direct Freight orders click here. For all TNT orders click here.